The Flood Resilience Zoning Text (the “Flood Text”) is one part of a wide range of efforts by the City to recover from Hurricane Sandy, promote rebuilding, and increase the city’s resilience to climate-related events, including coastal flooding and storm surge. The Flood Text encourages flood-resilient building construction throughout designated floodplains by removing regulatory barriers that hinder or prevent the reconstruction of storm-damaged properties. It also enables new and existing buildings to comply with new, higher flood elevations issued by the Federal Emergency Management Agency (FEMA), and to comply with new requirements in the New York City Building Code (“Building Code”). Download a two-page summary of the Flood Text. Following Hurricane Sandy in October, 2012, the Mayor’s emergency Executive Order No. 230 (issued on January 31, 2013), was replaced by the Flood Resilience Zoning Text Amendment, which was adopted by the City Council on October 9, 2013. Executive Order No. 230 was an emergency action that took an important first step to suspend zoning regulations that would have presented obstacles to reconstructing buildings damaged by Hurricane Sandy to more flood-resilient standards. The Flood Text provisions can be found in Article VI, Chapter 4 (Special Regulations Applying in Flood Hazard Areas) of the Zoning Resolution and will expire within one year of the adoption of new final Flood Insurance Rate Maps, which are the official flood maps on which FEMA has delineated the 1% annual floodplain, the 0.2% annual floodplain, Base Flood Elevations and floodways. In addition, on July 23, 2015, the City Council adopted the Special Regulations for Neighborhood Recovery, a text amendment intended to accelerate recovery in Sandy-impacted neighborhoods, by simplifying the process for documenting the condition of existing buildings, and by establishing a new zoning envelope on small lots for homes that need to be reconstructed. These regulations, which will expire on 2020, can be found in the Appendix A to Article VI, Chapter 4 of the Resolution. City Planning is currently working with community members and property owners across the city’s floodplain to update the Flood Resilience Zoning rules through a future citywide zoning text amendment. More information on DCP’s work on climate resiliency. In 1983, the City of New York joined the National Flood Insurance Program (NFIP) and adopted the Flood Insurance Rate Maps (FIRMs). The NFIP program is managed by the Federal Emergency Management Administration (FEMA), and has three components: to provide flood insurance, to improve floodplain management, and to develop maps of flood hazard zones. Once the City joined the program, NFIP required the adoption and enforcement of flood resilient Building Code regulations. These provisions are found in Appendix G: Flood-Resistant Construction of the Building Code, and apply within the City’s floodplain. FIRMs identify buildings in the floodplain and are used for the applicability of Appendix G as well as for calculating flood insurance rates. Within the FIRMs, the floodplain is divided into different areas of risk: the V-Zone, A-Zone and Shaded X Zone. Besides designating the geography and risk profile where flood events are likely to happen the FIRMs also indicate the Base Flood Elevation (BFE), the computed elevation to which floodwater is anticipated to rise during a flood that has a 1% chance of occurring in any given year, also known as the 100-year flood zone. FIRMs identify buildings in the floodplain and are used for the applicability of Appendix G as well as for calculating flood insurance rates. Within the FIRMs, the floodplain is divided into different areas of risk: the V Zone, A Zone and Shaded X Zone. Besides designating the geography and risk profile where flood events are likely to happen, the FIRMs also indicate the Base Flood Elevation (BFE), which is the computed elevation to which floodwater is anticipated to rise during a flood that has a 1% chance of occurring in any given year. Flood insurance is required for property owners with federally backed mortgages located within the 1% annual chance floodplain, or the V or A Zones as shown on the FIRM. The impact of Hurricane Sandy in October 2012 was a brutal reminder that a significant portion of the city is subject to flood risk, even beyond the floodplain delineated by the FIRMs. In 2012, FEMA was already working on an update to the FIRMs and after the storm, new, non-binding flood maps were issued for New York City. These maps, known as the Preliminary Flood Insurance Rate Maps (PFIRMs), reflect the best available information about the city’s flood risks at this time. Compared to the FIRMs, the PFIRMs generally show a larger geography with higher flood elevations. The PFIRMs were adopted on January 31, 2013, by Appendix G of the Building Code, and is used in combination with the FIRMs to designate risk. The PFIRMs are updated maps and, like the FIRMs, designate the 1% annual chance floodplain, dividing the floodplain into four different areas of risk –V Zone, Coastal A Zone, A Zone and Shaded X Zone. The V and Coastal A Zones are vulnerable to waves, while the A zone is an area that is vulnerable to flooding but not wave damage. FEMA flood maps also show the Shaded X Zone, which is also known as the 0.2% annual chance, and has a lower annual chance of flooding than the A Zone. Buildings located in this area are not currently required to comply with Appendix G of the Building Code. In 2015, the City appealed the PFIRMS on the basis that FEMA’s modeling contained technical errors. In October 2016, FEMA agreed to work with the City to revise the 2015 PFIRMs to better reflect current and future flood risk by creating two separate maps: one for flood insurance purposes, and the other for building and planning purposes. However, until the new flood maps are issued, flood insurance rates in New York City will continue to be based on the 2007 effective FIRMs while provisions of the Building Code and Zoning Resolution will continue to be based on the 2007 FIRMs and the 2015 PFIRMs (whichever is more conservative). In addition to the adoption of the PFIRMs as another standard for how to design buildings in the flood zone, the Building Code was amended to require higher elevations for certain building types: Appendix G incorporates freeboard, an extra margin of protection that requires the lowest floor to be elevated beyond the BFE. This height standard is called the Design Flood Elevation (DFE), which is the BFE plus freeboard (an additional one to two feet of elevation as a measure of safety). Any space below that level needs to be wet-floodproofed or dry-floodproofed (see below) depending on the building use. For example, for buildings located within the A Zones, single- and two-family homes are required to provide two feet of freeboard, and mixed-use or multi-family buildings, are required to provide one foot of freeboard. Appendix G requires owners of severely damaged or destroyed buildings in the 1% annual chance floodplain to comply with the flood resistant construction standards of the Building Code when they rebuild. The same requirements are applicable to any new development, or substantially improved properties, whether the development is located in whole or in part within the floodplain. In addition, property owners with buildings that are not substantially damaged or improved, may also wish to make their building comply with Appendix G since it can reduce vulnerability to future floods, and help reduce the cost of insurance premiums. There are a wide range of flood resilient construction practices that can enable buildings to better withstand floods. The most common of which are wet-floodproofing and dry-floodproofing, which can be utilized depending on the building use category. Wet-floodproofing: method designed to allow the passage of water within parts of the structure that are located below the flood elevation, while ensuring that the structure resists water loads. Wet-floodproofed areas can only be used as crawl space, or for parking, storage and access. Dry-floodproofing: method designed to seal a building’s exterior walls to flood waters while ensuring that the building has the ability to resist water loads below the expected level of flooding. For example, residential units need to be located above the Design Flood Elevation (DFE) but the lobby or access can be wet-floodproofed. Wet-floodproofing can be used by any building typology while dry-floodproofing can only be deployed in non-residential uses. Appendix G regulates these techniques by following the requirements of the International Code (I-Codes) and ASCE 24. These regulations comply with and exceed minimum standards required by the NFIP, although compliance with Appendix G regulations does not guarantee reduction of Flood Insurance Premiums. In general, buildings located in coastal areas subject to wave hazards (i.e., V Zone) are restricted from having any enclosed walls below the DFE and must elevate all active uses and mechanical systems. Buildings located in coastal areas that are not subject to wave hazards (i.e., A Zone) can be wet- or dry-floodproofed. Zoning regulates land use, density, building size, parking, signage and other features. After FEMA issued new maps and the City updated Building Code regulations for the flood zone, conflicts between Zoning and Building Code provisions created obstacles to building in the floodplain. Due to the urgency of removing these regulatory barriers to rebuilding in the floodplain, the Mayor signed emergency Executive Order No. 230, which suspended height and other restrictions to the extent necessary to rebuild to the latest flood-resistant standards. The Executive Order was by its nature an interim measure which needed to be codified by a zoning text amendment. Like the Executive Order, the Flood Text modified zoning and removed regulatory barriers that hindered or prevented the reconstruction of storm-damaged properties. It also introduced regulations to mitigate potential negative effects of flood-resistant construction in the public realm. The text was adopted in 2013 on a temporary, emergency basis and is currently being refined to make its provisions permanent, and address other issues identified through the Department’s research since its adoption. Learn more about the Flood Resilience Zoning Update. The Flood Text recognizes elevation requirements and allows buildings to measure height from the DFE. This change in how zoning envelopes are measured is intended to ensure that a new building in the flood zone need not be significantly smaller than the same building (in the same zoning district) outside of the flood zone, and thereby remove any disincentive to retrofitting and rebuilding in the floodplain. Where flood elevations are moderate, additional height is allowed to ensure the utility of spaces subject to flooding. For single- and two-family homes with DFE levels of six feet or higher, the zoning envelope can instead be measured from nine feet above the DFE. 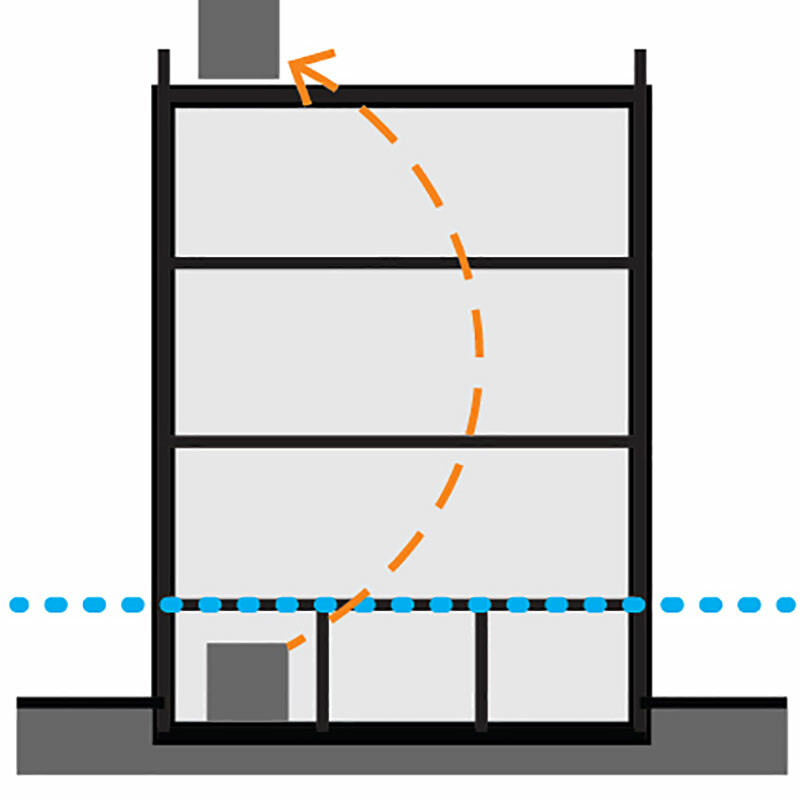 For multifamily buildings with DFE levels of five feet or higher, the zoning envelope can instead be measured from 10 feet. For commercial, mixed-use or manufacturing buildings with DFE levels of five feet or higher, the zoning envelope can instead be measured from 12 feet. The Flood Text recognizes the need to accommodate building access from grade. For external access, the zoning change allows for more flexibility with permitted obstructions provisions to accommodate longer stairs or ramps on yards, which may be necessary if the lowest floor is elevated to comply with Building Code requirements for the floodplain. In addition, acknowledging that interior stairs may be deployed, zoning allows for a level of discount in floor area with a cap based on the elevation of the lowest floor, in order to prevent buildings from losing that amount of living space. The Flood Text recognizes that Building Code resiliency standards may result in a loss of usable space when retrofitting existing residential buildings by wet-floodproofing. It also recognizes that dry-floodproofing is expensive. Therefore the Flood Text allows existing building owners to relocate an equivalent amount of floor area above the DFE when the ground floor is wet-floodproofed. In addition, in order to encourage active commercial streets, it allows building owners to exempt ground-level commercial or community facility floor area that is dry-floodproofed. Many existing buildings have below-grade parking spaces and may lose them when retrofitting and complying with Appendix G. The Flood Text allows alternatives such as relocating parking spaces in yards. In addition, in order to allow parking spaces to be located below elevated buildings, the Flood Text relaxes curb cut spacing rules, to the minimum extent necessary, if at least two off-street parking spaces are provided. The Flood Text recognizes the need for mechanical equipment to be relocated from subgrade spaces. Zoning changes increase the flexibility of permitted obstructions and allow for alternative locations such as on roofs or in yards, courts and open space. The flood text also overrides caps on the amount of mechanical space that can be exempt from floor area calculations in low-density districts. The Flood Text recognizes that flood regulations, and specifically elevated buildings, may have a negative impact on the streetscape. In order to preserve and improve neighborhood character, single- and two-family homes can chose from a set of design mitigation elements, such as porches or planting beds, to be installed between the facade and sidewalk. Multifamily buildings need to provide planting beds and a lobby at grade. Commercial buildings are encouraged to measure transparency requirements from grade. These provisions are found in Article VI, Chapter 4 and, if utilized, typically require the building to fully comply with flood- resistant construction standards. However, some provisions, such as elevation of mechanical spaces, are available to all buildings located in the Flood Zone, even if not fully compliant with Appendix G. Please refer to the Flood Resilience Text Amendment presentation for more information, and consult Article VI, Chapter 4 of the Zoning Resolution for eligibility and applicability of the provisions highlighted above.